Vera Laska was born Vera Oravec on July 21, 1928, in Kosice, Czechoslovakia. Vera was not Jewish, but she went to an all-girls public school and had many Jewish friends. She originally wanted to be a professional athlete and later dreamed of becoming a teacher. She recalled being angry and heartbroken when the German Army marched in to her country a few months before World War II began. Vera unwittingly joined the resistance when she and her friend, both expert skiers, agreed to lead from Slovakia to Hungary two men who lacked proper identification papers. Over the next several years, Vera made about a dozen such trips leading political and Jewish refugees as part of an underground railroad from Slovakia to Hungary to Yugoslavia and beyond. In spring 1943, Vera was arrested after being caught with false papers she had used during her trips across the border. After being jailed in her hometown for about a month, Vera was deported to Auschwitz II-Birkenau as a political prisoner. After her arrival at Auschwitz-Birkenau in early summer 1943, Vera made friends with some other women in the barracks. She recalled that they formed a “cooking club” in which, although they were starving, they would gather to discuss food and recipes to try to sustain morale. Relying on a theory that few people die on their birthdays, in 1944 on her birthday, Vera made the difficult decision to volunteer for an unknown assignment that would take her out of Auschwitz but might as easily result in her death. Along with some of her friends, Vera was transferred to work at a textile factory at Gross-Rosen. To impede production, Vera and other workers would participate in slowdown strikes and acts of sabotage when the guards were not looking. In early 1945, as the Soviet Army approached Gross-Rosen, the Nazis evacuated their prisoners to the concentration camp Dora-Mittelbau in central Germany. Vera then worked in a tunnel, measuring parts used in the German V-2 missile program. Her task was to divide the good rings from the bad, but she sabotaged the contents by arbitrarily dividing the parts. In March 1945, this camp too was evacuated and the prisoners were forced on a death march to the Mauthausen concentration camp in Austria. Vera seized her chance to escape in a moment of confusion, when hundreds of starving prisoners descended on a cauldron of soup. She fled into a nearby barn where she hid for the next four days. On the fifth day, a Ukrainian forced laborer who apparently knew of her hiding place, came into the barn and told her to come down because the war was over. She subsequently went to Prague and worked for the Czech War Crime Commission while also studying at the city’s Charles University. In 1946, Vera’s professors at Charles University decided Vera should go to America to study American history, so Vera chose to attend the University of Chicago. Here, she met her future husband, Andy Laska, and the couple was married in 1949. They had a son, Thomas, in 1952, and later adopted a son, Paul, from Costa Rica. 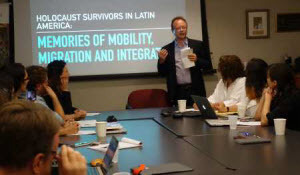 Vera continued her education and earned her doctorate in American history from the University of Chicago in 1959 and went on to be a professor and author of a number of books, including some about women and resistance during the Holocaust. 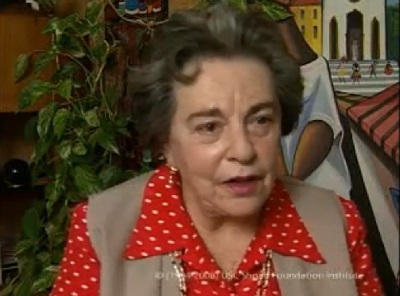 At the time of Vera’s interview in 1996, she and her husband were living in Massachusetts. She died in 2006. Vera’s story is included in the online lesson Living Histories: Seven Stories from the Holocaust. 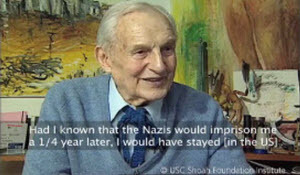 Survivors and witnesses of the Holocaust and other genocides have shared their stories and experiences in a collection of more than 55,000 two-hour audio-visual interviews with USC Shoah Foundation Institute for Visual History. ProQuest is honored to be in partnership with USC Visual History Archive to offer this material in its entirety to a broader audience and to contribute archival-quality transcripts of all of the testimonies. Watch the videos and learn more.